Cricket T20 Aus vs Pak 5th T20, live Cricket score , Pakistan got revenge. Aus vs Pak 5th T20, live Cricket score , Pakistan got revenge. Aus vs Pak 5th T20 match, Australia and Pakistan in Zimbabwe tri series has been played in Harare Sports Club Harare on 05 July 2018. Pakistan got revenge of their previous defeat in which ( Aus vs Pak 2nd T20) match Australia had defeated Pakistan by 9 wickets. Pakistan defeated Australia by 45 runs. Fakkar Jaman of Pakistan played a great inning of 73 runs in this Aus vs Pak 5th T20 match. Toss - Australia won the and opt to bowl first. After loosing toss Pakistan started batting and scored 194/7 in 20 overs. All batsman of Pakistan batted very well specially Fakkar Jaman who scored 73 off 42 in which he smashed 9 4s and 3 6s. H Talat 30, S Malik 27, S Ahmed 14, and Asif Ali scored 37 off 18 with the help of 3 4s and 2 6s. Andrew The 3, Richardson 2, Stonish and Maxwell got 1-1 wicket. 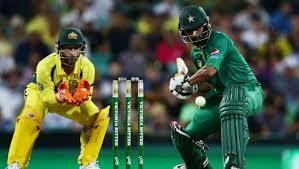 Australia started batting to get winning target which was 195 but due to bad performance of there batsman and good performance of Pakistani baller's Australia could score only 149 for the lose of 7 wickets and lost the match by 45 runs. D Arcy Short 28, Alex Carry 37, Finch 16, Stonish 16 and Andrew Tye scored 16 but this kind of performance was not enough to win Australia vs Pakistan 5th T20 match. Afridi got 3 wickets and other 4 bowlers got 1-1 wicket. Australia won the toss. Pakistan 194/7, Australia 149/7, Fakkar Jaman 72 off 43. Pakistan won this Aus vs Pak 5th T20 by 45 runs.